March Madness is here, cue the soundtrack! Sure, we like June for the Finals, and January for the NFL Playoffs, but for daytime viewing (i.e. a reason to go to bars at noon) and sheer "I've never heard of these players but this is the best game I've ever seen" excitement, you cannot beat March with both the NCAA and conference tournaments. Over the years March has given us Cinderellas and shocking upsets, boneheaded gaffes and amazing plays. It's also given us its share of badass teams. Badass has a lot of connotations, not all of them "good" in the conventional hoops sense (you'll see a few squads that had spectacular flameouts on this list), but we think we know a badass team when we see one: a little swag, a little grit, and a certain something that, win or lose (but mostly win), sets them apart from the pack. 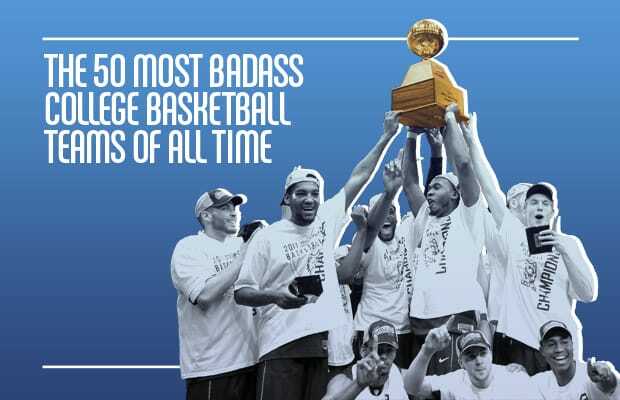 So from teams that changed the game, to squads that everyone hated but you loved, to ones that clearly had more fun than the rest of the field, these are the 50 Most Badass College Basketball Teams of All Time.